・Record the situation moved using the function GPS. ・Multiple records can be stored. ・Can see the movement status by displaying on a map the recorded data. ・Can record a screenshot of the display data. ・Can send　e-mail a screen-shot. Who is use My footprints. "Want to know about what time had passed which route later"
• Can not record the location information it is OFF Device & application “My footprints”, please set to ON location services. 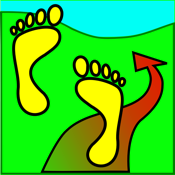 • During recording, until you move back to “My footprints” to termination or other apps (press home button) , measurement stops. · Significant error occurs in the location information in the location of the roof. · Affect the brightness of the brightness adjustment and other apps, we recommend that you return to the original brightness before exiting“My footprints”.